Home › Forums › Special Operations Divisions › MS › Your modifications.. This topic contains 16 replies, has 0 voices, and was last updated by Cap'n C. Worthy 4 years ago. It’s about time to take this forums virginity, so let’s start a topic! Do you have a cute little cupcake drawn behind your ear, a 50mm plug in your nose or just pierced ears? Let’s see them in here! So I guess I’ll start.. I currently don’t have any piercings due to job and martial arts..
My first tattoo, got it in December 2011..
Had it since March 2009, my first and only piercing. I’m also working on a Smiley Robot tattoo for my arm, I just need to find a good tattoo shop around Boise. Worked perfectly! Don’t forget to post a picture when you get it done. As it turns out, the $30 tattoo in California is $90 here, $70 without color, but who wants to see that face with no yellow? It appears I’ll be saving until next week for it. However, that’s the number one thing on my priority list with my next paycheck, seeing as I’ve put this off for months now. 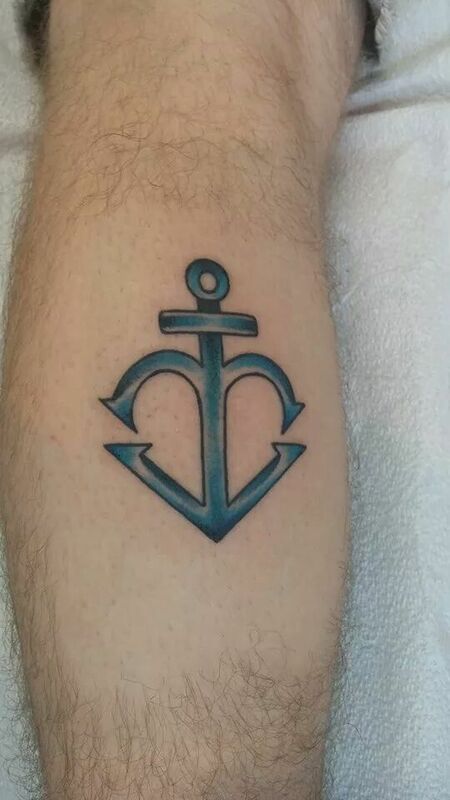 [Image Can Not Be Found] Finally got my tattoo.
? Malkavian Clan Mirror from White Wolf’s Vampire: The Masquerade RPG. Insanity incarnate.
? Stitched up White Rabbit with a pocket watch. 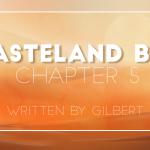 I was born under the sign of the rabbit and I overly enjoy anything non-traditionally Wonderland themed.
? Anbu Spiral from Naruto. Yesss….OTAKU.
? Sailor Neptune themed mermaid. Neptune is my favourite Sailor Senshi and I’ve always loved mermaids/sirens. I went up a size on my septum last week. I went from 3.0mm(8g) to a 4.0mm(6g). I had to wrap my previous claw with plumbers tape to 3.5mm before I could completely go up a size. Then I practically punched myself in the nose getting on one of the O-rings on. Fricken ow. I think my goal size will either be where I’m currently at or at least one more size up. 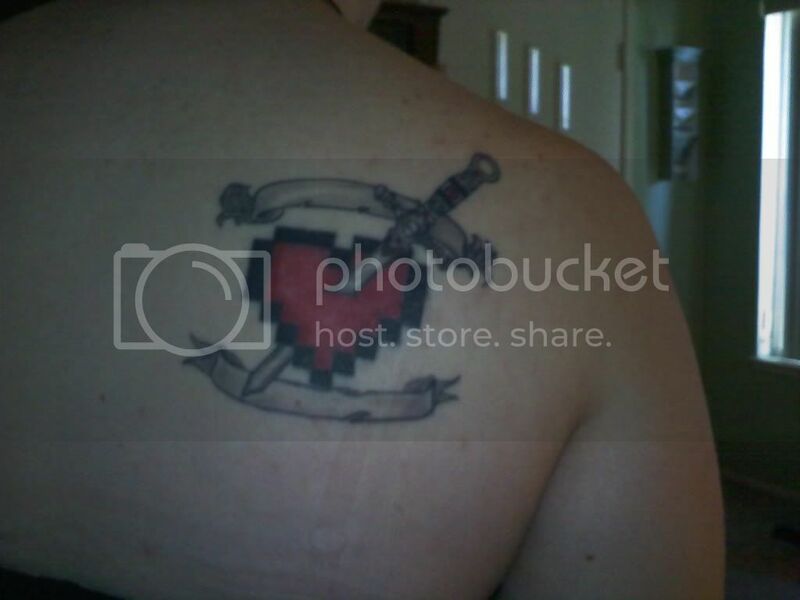 Bad picture of it, but this is my tattoo. I plan on getting a lot more, but here’s the first. Lucas and I have ourselves an appointment on September 11 to get all bloodied with ink. Anbu symbols. Awwww Yisssssss. Everyone’s body mods look amazing, keep em coming! As soon as I can get some new pictures i’ll be posting my body mods and possibly MacBane’s as well. Just got this yesterday. My fisrt one! This is my first (of hopefully many) tattoos that I got a few months ago. 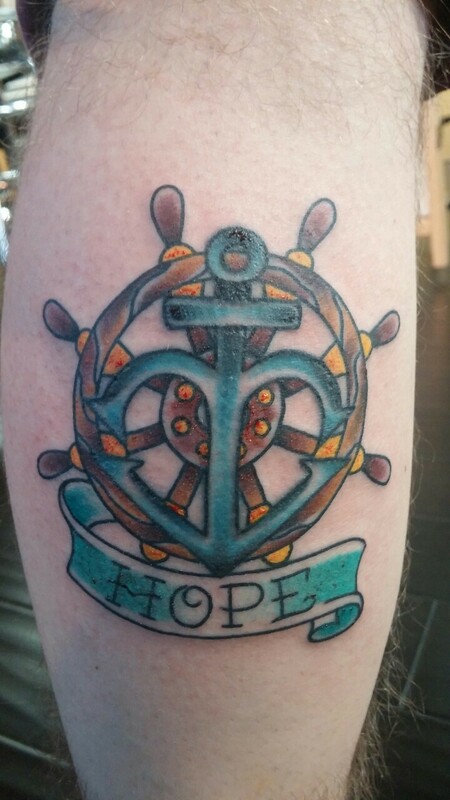 I’m actually going back in a couple days to add a ship’s wheel behind it and a banner on top that says “Hope”. Got my anchor finished today and I’m super pumped! Now to restart the part-time job that is taking care of a healing tattoo. But oh well, definitely worth it.